Whether you are a larger construction company or an individual looking for the right contractor to help build your home, finding the right professionals who are capable of plumbing, welding, and metal fabrication can be incredibly difficult. Many companies only specialize in one specific task, which means you’ll have to spend more time and likely more money so you can find other companies to do the jobs you need done for your project. If you want to avoid this hassle, then you should contact us at Hobbs Plumbing, Piping and Fabrication! 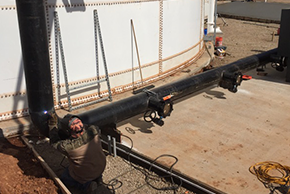 We are fully certified and licensed by the state of Oklahoma to assist projects of all sizes with their plumbing systems, and can also offer our welding and metal fabrication services. Whether you are an industrial-sized business looking to place a big order, or a small company that just wants to expand, we can provide what you need! We are 100% committed to ensuring that the residents of the Enid, OK community are fully satisfied by our services. We only employ individuals with years of hands-on technical experience in the plumbing, welding, and metal fabrication fields. We won’t consider the job complete until you are fully satisfied. We will be attentive to every one of your needs and will ensure you are happy with our services. If you’re looking to build a home, expand your business, or is a construction outfit looking for a professional and reliable contractor to help you, we are more than happy to provide our services. You can depend on us to handle ourselves in a professional manner and we’ll always complete your job on time and under budget. Contact us today at Hobbs Plumbing, Piping and Fabrication to find out more about what we have to offer!